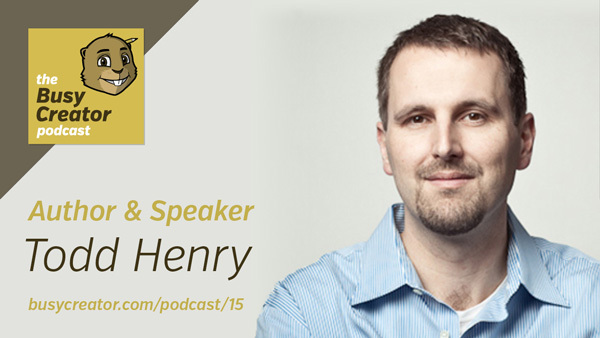 Todd Henry (@ToddHenry) is an author, speaker, workshop leader, and creative consultant who has written two books on practices observed in successful creative professionals, and tactics for being prolific, brilliant, and healthy. He regularly speaks and consults with companies about how to develop practices and systems for success. In addition, he’s been writing and podcasting since 2005 on his website,Accidental Creative. Read more about Todd on his personal site. For this particular discussion, we were slightly pressed for time, so to augment our chat, here is a video of Todd speakingat Creative Mornings in Cincinnati in November 2013. Rugby is a game of inches. Keep the ball; move forward one inch. Writing a book is simple, but it isn’t easy. Same with running a marathon. Focus is how you define the edges of your work. Relationships help you see the world through different lenses. Energy needs management; not just time. Stimuli are things that inform your creative process. Hours are the currency of productivity. Don’t make friends, launch friends. Your job is to make your boss’s job easier. Be resourceful. Todd’s rhythms change throughout the year with his children, or with his speaking calendar. By season, essentially. Look for milestones on which to build motivation. Don’t start over every time. Establish problem statements for each challenge or project. Your mind is wired to solve problems, not broad concepts. Distill problems into The Big Three. The largest open loops in your life. Write those down so your mind can dwell on them. Avoid relationships of convenience or obligation. Instead, build a circle of trusted people to discuss inspiration, challenges. Develop a study plan which you can stick to. Wake up early to chat with your circle. Look out for unclear definitions of work. Do not check your email in the middle of the night out of fear-of-being-out-of-the-loop. That’s just absurd. Embrace the ebb and flow of productive seasons. Prune your obligations to preserve energy. Create habits of design, not default. Avoid the need for approval of others; listen to our own internal compass. Be ruthless about your time and energy; don’t let people chip away at your best hours.